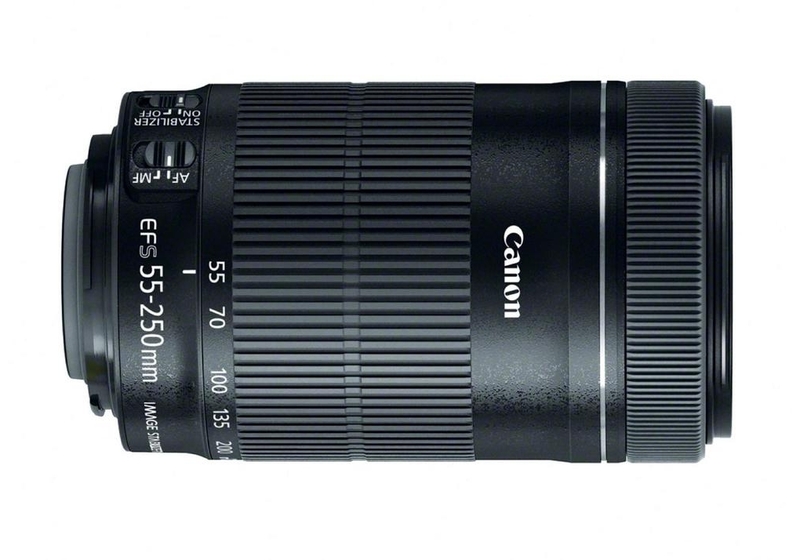 The Canon EF-S 55-250mm f/4-5.6 IS STM Telephoto Zoom Lens is a long-reaching zoom lens that provides a 35mm-equivalent focal length range of 88-400mm, covering portrait-length to telephoto perspectives to suit working with distant subject matter. Greatly benefitting this lens' reach is the incorporation of image stabilization, which works to minimize the appearance of camera shake by up to 3.5 shutter speed steps to support handheld use in low-light conditions. An STM stepping focus motor is also integrated into the lens' design to provide smooth, quiet, and fast focusing performance that is ideally-suited to video applications as well as tracking moving subjects. The rear focusing system, high-speed CPU, and an enhanced AF algorithm also contribute to quickened overall AF speeds. Full-time manual focus is also supported to permit fine-tuning of focus even while working in AF modes. Additionally, the front lens section does not rotate during focusing to better facilitate the use of polarizing filters. The optical construction of the lens employs one ultra-low dispersion glass element to help reduce chromatic aberrations and distortion throughout the zoom range while also enhancing contrast and clarity. Optimized lens coatings have also been applied to ensure color fidelity by countering the effects of lens flare and ghosting. Για τις δόσεις είναι απαραίτητη πιστωτική κάρτα που υποστηρίζει δόσεις.